As a CEO, or Decision-Maker, how do you juggle between business development & managing your day-to-day operations? How do you accelerate "Digital Transformation" in your organization when you are not digital expert yet? TechTalks.ph believes that every company is important and needs the professional attention it deserves that is why on May 11, 2017, The Digital Literacy for CEOs & Decision Makers was held at A Space Cebu from 5 PM to 9 PM to highlight the need of digital proficiency. The event was a dinner-seminar that targeted global professionals and discussed how to enhance digital capacities to world-class standards as it is considered that part of being successful industry leaders with optimum profits, they should strive for excellence in technology as well. The exclusive seminar invited Robert Cristobal as the resource speaker. He is an international digital marketing consultant who’s worked with SMEs and MNCs in Singapore, SE region and the Philippines. He is also the Chief Content Officer of TechTalks.ph, Founder and Creative Storyteller of Frame 316 (Singapore) and Head of Content of BAM Agency Hub (Singapore). How does digital marketing really work and why do you need to make the shift today? Can you incorporate digital techniques to your existing traditional marketing plans and budgets? How much do you need to invest to get the results that you need? What's wrong and what's right with going digital? How sales and marketing are different from each other? TechTalks.ph wants to highlight the importance of Digital Knowledge especially if one runs / owns a business. 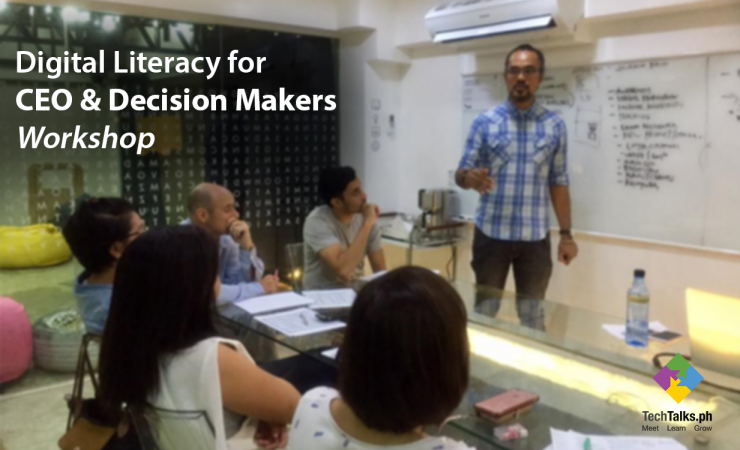 The workshop shared so many important lessons and one of it is Digital Literacy is a powerful tool to use in the ever growing business industry and the perfect time to learn is now. TechTalks.ph offers Digital Marketing Foundations Certification Course (Online), if you want to learn more about this course, contact info@techtalks.ph for more information.